Security was tight. With the dozens of beret-clad and armed POLRI, squads of the special reaction unit (Gegana) dressed in black, military police, army, and rooftop snipers, journalists and onlookers were more concerned about getting on their wrong side that morning than of any terrorist attack. However, once the Australian Prime Minister arrived to pay her respects to the victims of the 2002 Bali Bombing, all eyes were on her. In Bali for the ASEAN and related summits, the PM’s visit to Ground Zero was a small yet symbolically important part of her tightly-packed schedule. Australia-Indonesia diplomatic relations have had a number troughs over the past twelve months. A few days ago, Indonesia’s foreign minister and military chief voiced their respective concerns about the newly-announced initiative to place US Marines in Darwin from 2012 (with the FM noting he’d only been told informally a few days prior to the announcement). Add to that a Prime Minister who has publicly stated that foreign affairs is not her forte, failed to coordinate with her Foreign Minister on policy changes, and announced asylum seeker initiatives without alerting the countries in question. Nonetheless, the visit to the Bali Bombing Memorial—simple and brief as it was—shows a willingness to engage in ground level aspects of the bilateral relationship. Several locals around the scene expressed a positive reaction to her efforts. The coverage by BaliTV would have further relayed the PM’s message of solidarity and respect into the homes of Bali viewers. The visit also signals a level of trust in the security provided by Indonesian forces and intelligence services. Since the 2002 bombing, Indonesian authorities have expanded their capabilities through joint training with foreign partners, intelligence coordination, legal reform, and the establishment of counter-terror police unit Densus 88 (Detachment 88). 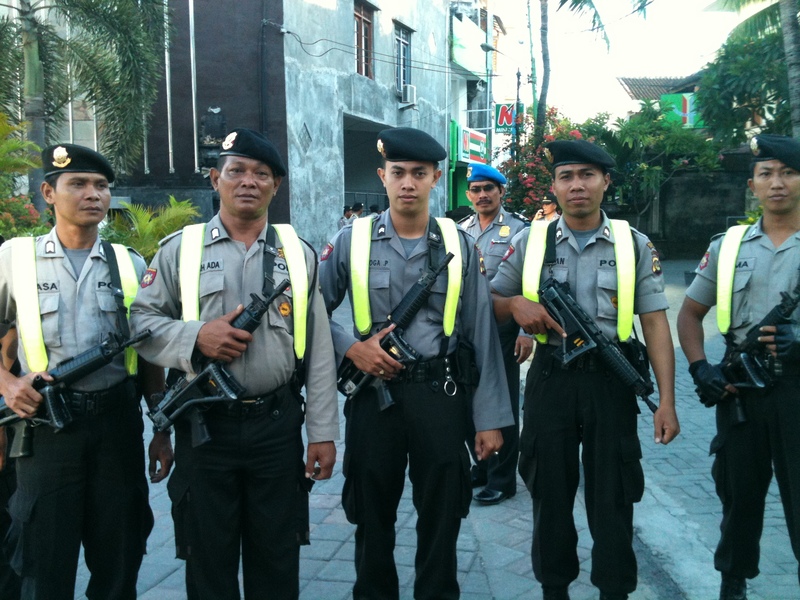 If business in Bali and the January arrest of terror suspect Omar Patek attest, benefits are being reaped. After laying the wreath at the Memorial, the PM spoke to some Australian tourists. Australian officials asked if I could say a few words to her about the lives of Bali locals after the 2002 bombing so I was included in the group. It would have been better had she spoken to some locals directly (even via translator) but such exchanges are not always easy to organise. That said, engaging with Australians here and asking them about their Bali experiences (apart from having good political mileage) would have left her with some impressions of the island through Australian eyes. President SBY may never be ‘bapak’* to Gillard as Suharto was to Keating, and there are still many aspects of Australia-Indonesia bilateral relationship that remain under-explored. Nonetheless, here was PM Julia Gillard, in Bali at Ground Zero, having a go. This entry was posted in Australia, Foreign Policy, Indonesia, International Relations by Natalie Sambhi. Bookmark the permalink. Thanks very much for your account of this trip and its underlying importance. You do very fine work and I look forward to reading your posts. With the coming US naval base in Darwin you may find these links to be interesting.